What kind of blessings are we counting on? When we pray for God’s blessings, most likely we envision people, things, and conditions that we believe will make us happy—loving relationships, close family and friends, good health, material things, financial assets, good jobs, successful careers, long life, and much more. While Scripture includes some of those as blessings or rewards (e.g., Gen.15:1-3; Job 42:12-17; 1 Sam.2:20-21; Ps. 112), it more frequently refers to God’s blessings in spiritual terms or as a state of being in relationship to God or Jesus Christ. In the priestly blessing that God gave Aaron to proclaim over the people of Israel (Num. 6:24-26), and later used as a benediction in Christian worship services, the blessing covers God’s people with his divine protection, pleasure, graciousness, favor, and peace. When Jesus taught his disciples and followers about blessings in the Sermon on the Mount (Matt. 5:3-11), he didn’t promise earthly prosperity, pleasure, or laughter. He promised a joyful, hopeful experience with God—independent of outward circumstances and things that we deem necessary for happiness. In fact, he taught that God blesses the poor in spirit, the mournful, the spiritually destitute, the persecuted, the oppressed, the unaggressive, the powerless, the merciful, the peacemakers, and the pure in heart. All of these blessings are ours to enjoy during this lifetime and are a foretaste of the eternal glory that we will enjoy in our heavenly realms (1:3; 2:6; 3:10) at our death or upon Christ’s return to establish his new heaven and new earth (Rev. 21:1). So as we give praise and thanks to God for our present blessings of shelter, clothing, food, loved ones, health, jobs, and the many other things that help to make life enjoyable, let us not cling to them and take them for granted. They are not permanent. We could lose them. And may we remember to daily give praise and thanks to God for all the spiritual blessings that are ours because we belong to Christ. Those blessings are permanent and eternal, and we can count on them! You raise a good point Derrick. 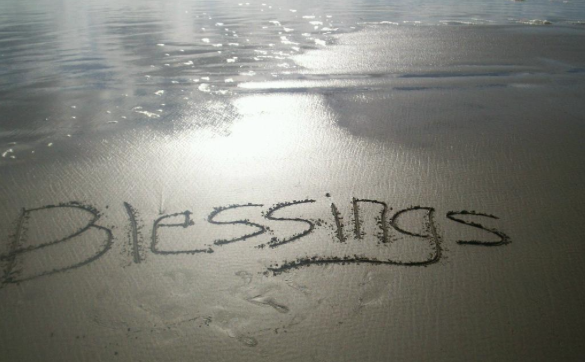 Many of the things we consider blessings actually hinder our reception of the real blessings of God. Thank you for your response, Joseph. Grace and peace to you. Being a son of a great King has awesome benefits. Thanks. And for daughters of the King too! Grace and peace to you and Carol. Thanks for doing lots of scriptural background for me. God bless you.